CSI notwithstanding, forensics experts cannot always retrieve fingerprints from objects, but a conformal coating process developed by Penn State professors can reveal hard-to-develop fingerprints on nonporous surfaces without altering the chemistry of the print. "As prints dry or age, the common techniques used to develop latent fingerprints, such as dusting or cyanoacrylate -- SuperGlue -- fuming often fail," said Robert Shaler, professor of biochemistry and molecular biology and director of Penn State's forensic sciences program. This happens because most of the techniques currently used for developing fingerprints rely on the chemistry of the print. 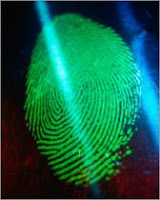 Fingerprints are made up of a mixture of secretions from the body that reacts with different chemicals to form a visible or fluorescent product. Infrared and x-ray imaging also target specific chemicals left behind by the ridges and valleys in the skin. "Lots and lots of processes take advantage of the chemistry of fingerprints," said Shaler. "This approach looks at the geometry of the fingerprints." The conformal coating applications suggested by Shaler and Akhlesh Lakhtakia, Charles Godfrey Binder Professor in engineering science and mechanics, use the physical properties of the fingerprint, not the chemistry of the substances left behind. In fact, the researchers believe that even after the fingerprints are developed using the coating, forensics experts could sample the fingerprint material to determine specifics about the person who left the prints. "The body chemistry of the person who left the fingerprint can tell us some things," said Shaler. "If the suspect is older or younger or a lactating mother, for example." The researchers used a form of physical vapor deposition -- a method that uses a vacuum and allows vaporized materials to condense on a surface creating a thin film. Normally, the deposition process requires exceptionally clean surfaces because any speck of dust or grease on the coated surface shows up as a deformity. However, with fingerprints, the point is to have the surface material's ridges and valleys -- topography -- show up on the new surface so analysts can read them using an optical device without the necessity of chemical development or microscopy. "This approach allows us to look at the topography better and to look at the chemistry later," said Shaler. "We wouldn't have thought of this by ourselves, but we could do it together." One benefit of this approach would be the ability to retrieve fingerprints off fragments from incendiary or explosive devices and still be able to analyze the chemicals used in the device. The specific method used is a conformal-evaporated-film-by-rotation technique developed to create highly accurate copies of biological templates such as insect eyes or butterfly wings. Both are surfaces that have nanoscale variations. "It is a very simple process," said Lakhtakia. "And fingerprints are not nanoscale objects, so the conformal coating is applied to something big by nanotechnology standards." The researchers tested two materials for coating, magnesium flouride and chalcogenide glass -- a combination of germanium, antimony and selenium. The coating material is heated in a vacuum, while the artifact to be coated is rotated fairly quickly to allow deposition over the entire surface. "We need to have a coating that is uniform as far as we can see," said Lakhtakia. "But we do not need much of a coating -- in the range of only a micron." The researchers tried coating a variety of fingerprints on glass and even on tape. They coated pristine fingerprints and those that had been fumed with SuperGlue. In all cases, the coated fingerprints were usable. Of course, like all approaches, this one can only be used on non-porous surfaces, surfaces that do not de-gas. The equipment used to deposit the coating is a laboratory device, but it can produce the coating in about 15 minutes. The researchers would like to design a portable device that could be brought to a crime scene and produce readable fingerprints on site. "We are in the process of redesigning the chamber and looking not just at fingerprints, but at other objects," said Lakhtakia. "These would include bullets, cartridges, footprints, bite marks and lip impressions." Shaler and Lakhtakia have filed a provisional patent application on this application.